Eat, Shop, Eat, Relax, Eat! Housed in a former car dealership built in the 1960s, Family Meal gleams with large glass windows, distressed wood surfaces, and ample counter seating overlooking the bustling open kitchen. You may remember this restaurant&apos;s owner, Bryan Voltaggio, from the show Top Chef. Linger over mimosas and upscale comfort foods while you recap your trip so far! The Visitor Center is the perfect place to begin your journey! Located in a beautifully renovated circa-1899 industrial warehouse, the visitor center holds 2,200-square-feet of interpretive exhibits. A state-of-the-art theater features the award-winning film about Frederick, "A Turn of the Wheel." A wide variety of maps, guides and information on regional attractions and events are available. Friendly, knowledgeable Visitor Services Specialists are happy to suggest sites and attractions to suit your specific interests. A small souvenir shop offers items for purchase including Downtown Frederick Gift Cards. 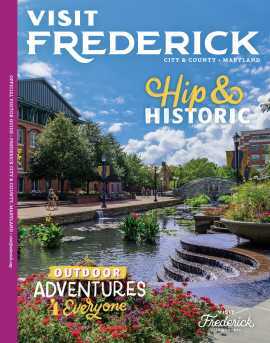 Take advantage of 3 hours of free parking (validation available in the visitor center) and explore Frederick&apos;s charming Downtown! Stroll along one of America&apos;s best urban parks, Carroll Creek Park. The park began as a flood control project, but quickly turned into a perfect venue for commercial, residential, cultural, and recreational development. The 1.3 mile stretch features brick walkways, beautiful bridges, and several unique public art projects. One such project, the Community Bridge Mural, took ideas from hundreds of people and combined them to turn a concrete bridge into what appears to be a beautifully decorated ivy-covered stone bridge, each stone showcasing a different image suggested by the public. The Wine Kitchen serves not only delicious and high quality local cuisine, but also locally produced beers, wines, and spirits! Enjoy a wine flight or cocktail over lunch. If the weather is nice, ask for a table outside along Carroll Creek! Walking through Downtown Frederick is an experience like no other. Fifty blocks of shopping, dining, and unique attractions are showcased today. Peek into some of the boutique shops and find pick up something cute to remember your trip by! Stop by Simply Beautiful Boutique for so southern finds or browse Crisafulli&apos;s Cheese Shop for the perfect compliment to your favorite bottle of wine. Speaking of bottles, this wine bar and cafe features a high-tech self-serve system, dispensing a wide variety of carefully selected wines. Purchase a reloadable card to gain access to as many wine tastings (or full glasses) as you&apos;d like. For fine Spanish cuisine in a relaxed setting, this Downtown spot delivers inspired dishes that are made to share. Order everything that looks good and sample it all. The menu changes frequently, so you know you are getting the best fresh ingredients. When exhaustion starts to kick in, head to this charming B&B. A recently renovated mansion, everyone in your group can stay in a beautiful room just feet from each other. Stay up late chatting by the fire and get a good night&apos;s sleep when you are ready! You certainly can&apos;t stay here and not take advantage of their gourmet breakfast! With a variety of sweet and savory options available, everyone is sure to enjoy this impressive spread. This incredible spa will exceed all your beauty expectations. Housed in a beautifully restored historic home, New York New York offers the latest color and cut techniques, relaxing massage, facial and body treatments and current advancements in nail care. The objective is simple; create memorable guest experiences from talented professionals in a relaxed atmosphere.